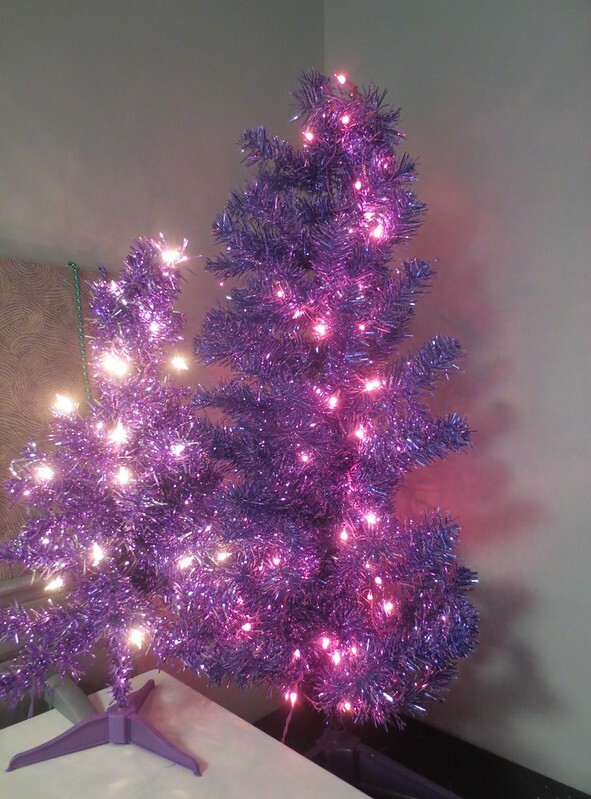 I’m facing a more stressful week at work than usual, so this morning before my first meeting I decided to put up the little purple Christmas tree that I bought for my office a couple years ago (back when Purple Systems still had purple as our corporate color). Now some might say when overwhelmed by work, taking time out to decorate my office was not wise, even though it took me hardly anytime at all to pull the tree out of the box, attach the three legs of the stand, plug it in, and unbend the branches (not that I did a great job of that), but I decided it would be good for my overall mental health to have something shiny and sparkly to look at when I return to my office after yet another meeting. So good, in fact, that I also set up the even littler purple tree that I got last year. Nothing reduces stress like color coordinating your Christmas tree with your blog. Looks good to me!